The most experienced combatants know the best offence is a good defence - and the best defenders get the most from their armour with Pathfiner Player Companion: Armor Master's Handbook! From methods of scribing spells onto pieces of armour to aplethora of different ways to use a shield, this guide has new options for every iron-clad hero,giving steely nerves adventurers all the tools they need to escape any scrap unscathed. Durable new archetypes to help combatants survive any assault, including the armoured battle age, the shieldbearer, the yojimbo, and more! Magic armour and shields of every shape and size,from the sprightly arachnid harness to the unstoppable Clockwork armour. New methods to get the most out of your armour, from fighter armour training to combat style feats that emphasise your chosen type of protection. 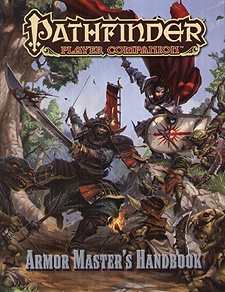 The Pathfinder Player Companion is intended for use with the Pathfinder Roleplaying GAme and the Pathfinder campaign setting, but can be inc orporated into any fantasy world.